A nationwide art project to celebrate the 100th anniversary of the 19th amendment that gave women the right to vote in America. In 2020, women will have been voting in the United States for 100 years, thanks to the passing of the 19th amendment to the U.S. Constitution. It took 36 states to ratify the amendment giving women the vote. 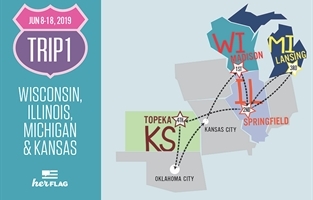 In 2019, I will begin a 17 separate trip, 14 month journey traveling in order of ratification to all 36 states that gave women the right to vote, to collaborate with a women artist in each state. Together we will reimagine our nations flag. This new flag will have 36 stripes, one for each of the ratifying states. Each artist will publicly hand me the stripe representing her state and I will sew it onto the flag in her capital city. The public will be invited to witness this performance and take a moment to remember this important anniversary in American history. The flag will be HUGE 18’ x 26’. The flag will be completed in August of 2020. This project is about moving forward. This project is not about Democrats or Republicans. It is about Americans and celebrating an important anniversary in our history and how we can encourage more women to be involved in our democracy. The year 2020 will be a presidential election year. It is sure to be a tough year full of negative politics. I hope that all who participate or witness this project will have a respite from the political mayhem that is sure to be swirling around us in 2020. 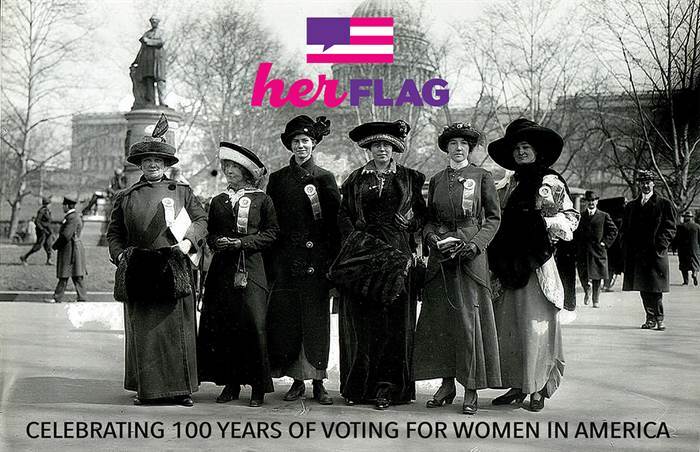 The journey and the completed flag are a thank you and a visual love letter to the states that gave women the right to vote. Why am I making Her Flag? I am an artist in Oklahoma, the middle of the country, the perfect place to base this nationwide project that reaches from shore to shore of the United States. My work explores the female experience and women’s issues. I have shown my mixed media work from coast to coast in the United States at museums, galleries and universities. I was awarded the Brady Craft Alliance Award for Innovation in fiber arts in 2011 and led an art making workshop at the Brooklyn Museum in New York in conjunction with a retrospective exhibition of female pop art. In 2011, I created a body of work that highlighted women that lived and fought for the right to vote for women in the U.S. To create these works, I dove into the research. I fell in love with this time period and the women I met. I know this might sound strange, but I didn’t realize how hard this fight was. That generations of women who fought for the right to vote died before the 19thamendment was passed. Susan B. Anthony didn’t live to see women get the right to vote. I also had never read about women like Frances Wright, Victoria Woodhull and Miriam Leslie in my school textbook growing up. Reading and learning about this time in American history became a passion for me. I have been using the American flag as a vehicle to explore my feelings about being a woman. It was only natural to continue on with this on a larger scale for this project. My existing work is mixed media collage. This project is a larger version of the work I am currently creating but rather than combining materials it combines the history and experience of the 36 women artists that I will be collaborating with. My family has been in the United States since its inception. I can track family back to the revolutionary war. I have found 3 ancestors who fought in the Revolutionary, my great great great grandmother Jesse Hayes was an early member of The Daughters of the Revolution. Two family members fought for the Union during the Civil War and were captured and held in Confederate prisons. I also had family that came West and settled in Oklahoma in the 19thcentury. I have a family legacy that has actively participated in the American dream since its founding. I want to continue that legacy of service through my art making, by honoring the 100thanniversary of the 19thamendment that gave women the right to vote.